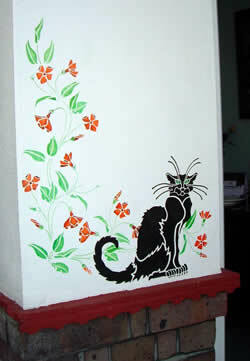 The photographs on this page have been sent to us by customers showing how they have made use of our stencils. 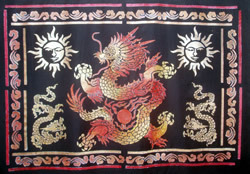 Click on any image to take you to the featured design in our catalogue. 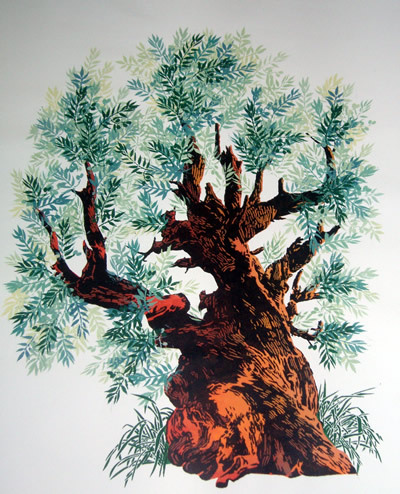 This ancient olive tree is painted on high quality canvas by the head designer at Stencil Kingdom Julie Brightman. Please contact us if you are interested in purchasing this unframed canvas work and would like more details. 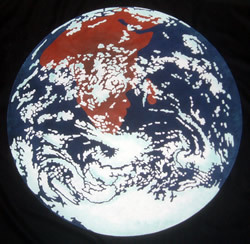 This three layered stencil of our planet has been painted on Fabric. 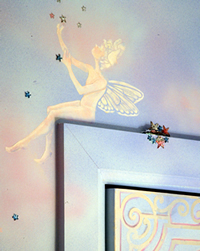 Our stencils were used to decorate the nursery featured in the book “THE HOUSE THAT FAUX BUILT”. 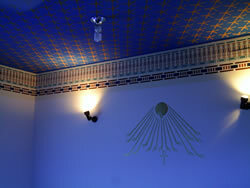 The artist Melanie Kershner blended stencils from our Ephesus collection with elements from our Greek Room Theme. 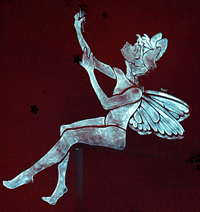 Melanie has used phosphorescent pigment on the fairies so that when the lights are dimmed, they glow in the dark. 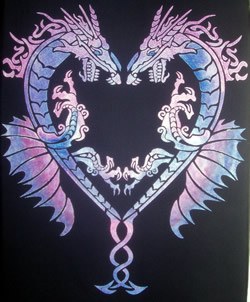 This dragon heart was painted on fabric. 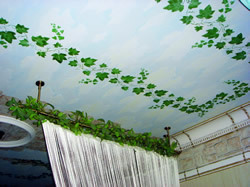 Ivy from our foliage section adorning a ceiling. 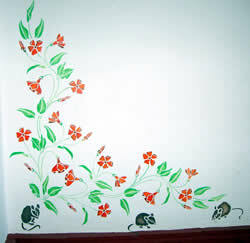 Jan Cook sent us these images of her delicate stencilling. 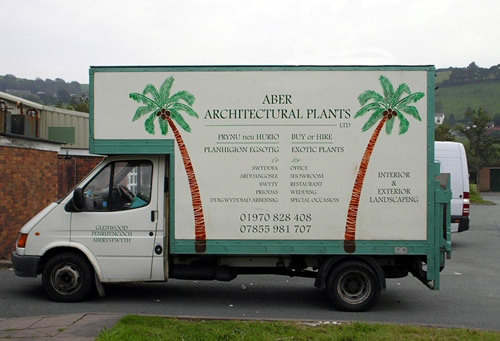 Ian Pidgeon finds his van gets a lot of attention since adorning it with our six foot palm tree. 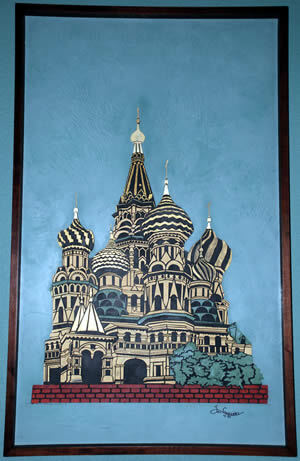 "This is the Russian Cathedral that I did this summer. It's one of your stencils. 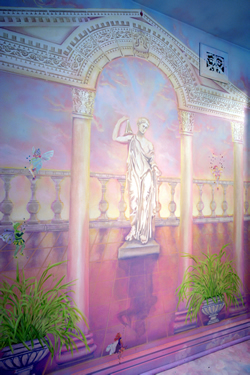 This is done in Safra's Venetian Plaster, Fresco paint. 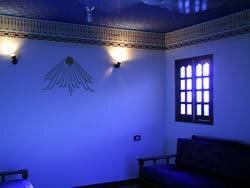 There is four layers of Fresco Paint all trowelled through your stencil. Only the Cathedral tops are done in gold leaf, all the rest is trowelled in Fresco paint. It turned out better than I thought". "I just noticed that you used my skateboard for yor photo gallery, thats pretty cool.... 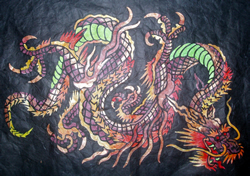 I just wanted to send you a newer nicer deck, I made this for a friend in Japan; I also used some Kanji from your site. Nick".